ALBUQUERQUE, N.M. – Sandia National Laboratories won the Federal Laboratory Consortium's (FLC) national 2017 Award for Excellence in Technology Transfer for a heat-exchanger technology that makes power generation more efficient. The Technology Transfer award honors employees of FLC member laboratories and non-laboratory staff who accomplished outstanding work while transferring federally developed technology. In power generation, even small increases in heat transfer efficiency can greatly boost production and cut the cost of electricity. The micro-channel heat exchanger (MCHE) is a technology that makes refrigeration, heating, and gas processing– as well as power generation– more efficient. Sandia's Selection, Evaluation, and Rating of Compact Heat Exchangers, or SEARCH, is a software suite used to design efficient MCHEs. The design requires a combination of analytical performance estimation, computational fluid dynamics, and finite element modeling, with each cycle taking from hours to days. Sandia's simplified design tool uses a sub-heat exchanger thermodynamic model, American Society of Mechanical Engineers (ASME) Boiler and Pressure Vessel Code mechanical constraints, and a thermal-hydraulic solver within the Engineering Equation Solver platform to model any combination of liquid, gas, two-phase, and supercritical fluid. Demand for industrial MCHEs has outstripped supply. Until recently, just one company– based outside the U.S – has done large-scale production of industrial MCHEs. A domestic supplier, on the other hand, could reduce costs and increase supply and energy efficiency in a variety of uses. 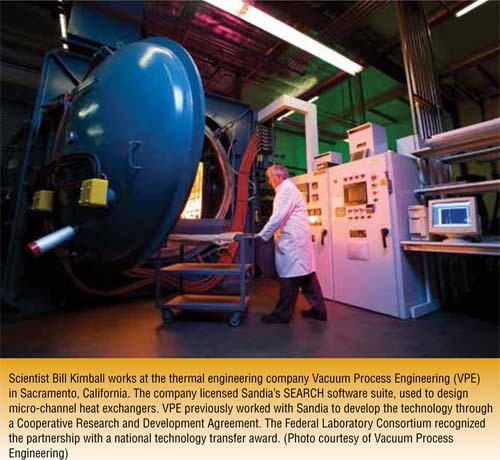 Sandia (www.sandia.gov) partnered in 2014 with U.S. manufacturer Vacuum Process Engineering (VPE) through a Cooperative Research and Development Agreement (CRADA) to commercialize the technology. Sandia licensed SEARCH to the Sacramento, California, company, which has used it to reach international quality standards, including ASME Boiler and Pressure Vessel Code certification, and enter the MCHE market as a domestic original equipment manufacturer. VPE produces MCHEs in the U.S. and sells them domestically and internationally. "Sandia implemented a fast-paced project plan while constantly adapting to changing market forces faced by VPE," said Matt Carlson, Sandia's principal investigator on SEARCH, in a press release announcing the award. "The project has expanded from a CRADA into a joint program between Sandia, VPE, and the Department of Energy to combine VPE's commercial goals and DOE's advanced power-production goals. The expansion has resulted in multiple improvements to the SEARCH software, allowing VPE to respond quickly to customer requests." He said the teams at both Sandia and VPE (www.vpei.com) "were essential to making this happen, and the FLC award shows we are committed to creating real and immediate value for our partners."